Home Labrador Facts & Fun Can Dogs Sense Pregnancy and Other Medical Marvels? Can dogs sense pregnancy? If so, how exactly do they pull off this incredible feat? And if dogs sense pregnancy, what signals can you look for in your own pooch (or even in other dogs you may meet) that will let you in on the secret? 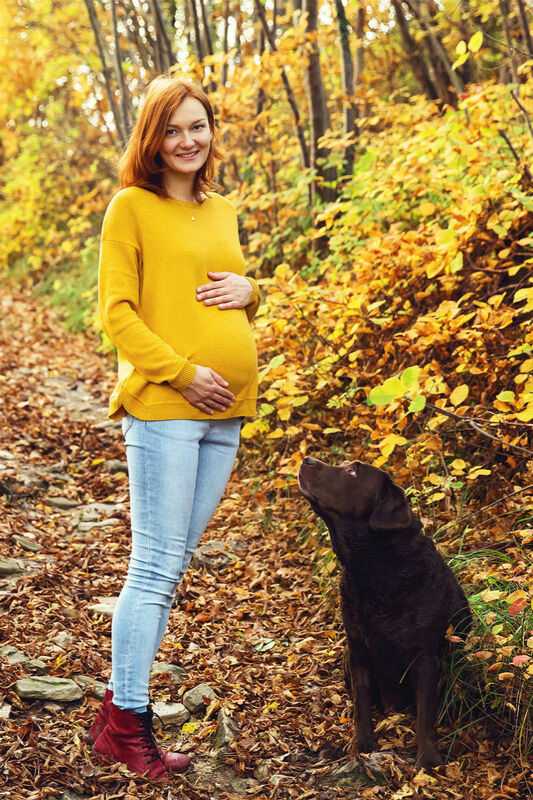 While the research available on this specific topic is not robust as of yet, there is a great deal of research in the related area of biological and medical detection dogs to support dogs’ potential ability to sense pregnancy as well. So let’s dig deeper to find out: Can dogs sense pregnancy? It is possible that dogs can sense pregnancy. They have an amazing sense of smell and hearing that can detect tiny changes before we might even notice them. Research is ongoing but there is evidence to suggest that our pets might know we are expecting before we do! But how can we be sure, and what is the evidence so far? Let’s take a look! Many people today rely on the help of medical detection dogs to manage serious and potentially life-threatening health conditions. This very specialized type of service dog is trained to scent out subtle changes in blood sugar for diabetics and the release of volatile organic compounds (VOCs) in cancer growth. Medical detection dogs can also be trained to smell when a person is about to have a narcolepsy incident, a fainting spell, a migraine headache or an epileptic seizure. While this is still a relatively new field of research into canine abilities as medical helpmates to people, the evidence continues to accumulate in support of moving forward with the development of owner/canine partnerships for long-term health management purposes. In the related field of psychiatry, research shows that service and therapy dogs can even sniff out mood changes to help people with severe psychiatric issues such as depression, anxiety, schizophrenia, autism or post-traumatic stress disorder. All of this interest in harnessing the potential of the canine nose began, of course, when people figured out that dogs could sniff out dangers such as bombs or drugs, and could even track down and rescue people trapped underneath snowbanks after an avalanche. In one 2016 medical trial, dogs were presented with the urine of 34 thyroid cancer patients. A former search-and-rescue German Shepherd dog named Frankie correctly identified thyroid cancer in 30 out of the 34 samples with a simple sniff. In another similar trial, a Belgian Malinois dog correctly identified prostate cancer in 30 out of 33 urine samples from prostate cancer patients just by sniffing their urine. Can Dogs Sense Early Pregnancy? It is great that dogs can smell cancer, but can dogs possibly scent out pregnancy as well? To hear today’s researchers tell it, the short answer to the question “do dogs know when you’re pregnant” is yes. What is even more interesting, however, is how dogs can sense pregnancy in humans. How do they do it, precisely? We now know that marine mammals such as dolphins and whales can use echolocation to sense (or more accurately, to “see” via sonar) when humans are pregnant. But of course, dogs don’t have the ability of echolocation. So how can dogs tell if you’re pregnant? Researchers hypothesize that dogs may use more than just one sense (i.e., not just their nose) to detect if you are pregnant, and they don’t have to be closely bonded with you to do it. Here is a great example: Actress Tia Mowry discovered she was pregnant with the help of a dog she had only just met that didn’t belong to her. The actress was doing a photo shoot. The photographer brought her pooch along, and the dog proceeded to shower Mowry with attention. This made Mowry’s radar go up since she had been trying to get pregnant. She later posted a message on Instagram about her happy news and gave the photographer’s pup credit for the discovery. How Does My Dog Know I’m Pregnant? So now let’s look at how can dogs sense pregnancy. The most potent way, according to canine biologists, is still by doing what dogs do best—sniffing. Homo sapiens (that is, us) have about 5 million scent receptors in our noses. Contrast that with the estimated 200 to 300 million scent receptors in the nose of the average dog. What this means is that dogs can detect the tiniest scent changes at a level our noses can’t even dream of doing. What happens when you become pregnant? Your body starts changing right away. Specifically, your hormone levels change, and this information changes the scent of your breath and your skin. Your own pup will notice right away when your scent changes although you may not have any idea what is going on. But this still doesn’t explain how can dogs sense pregnancy in people they don’t know. Do Dogs Sense Pregnancy in Strangers? To understand how a dog might sense pregnancy in strangers, we have to look at how dogs behave with other dogs. When two dogs meet, whether they are old friends or total strangers, they will typically start out by sniffing each other. Canine psychologists explain that dogs do this because the crotch is a great repository of sensory (hormonal) information whether you are a dog or a person. So if you’ve ever wanted to crawl under the couch and hide when your pup bounded up to a guest and stuck his nose directly into her crotch, remember that your dog doesn’t realize this is considered socially awkward behavior in people. She is just gathering potentially useful information. There is a set of glands located in every person’s crotch area. These glands, called apocrine glands, pump out pheromones that are full of interesting information. Your pheromones change when you are menstruating, ovulating, just after you give birth and (no surprise) when you become pregnant. Anyone who has ever lived with or near a male dog that is “unfixed” (not neutered) can attest to how male dogs just seem to know when an “unfixed” (not spayed) female dog is in heat (ovulating). In fact, depending on who you ask, male dogs can scent a receptive female dog located anywhere from one to three miles away. Male dogs can also scent out whether a female dog is already pregnant or even if she is having a “false pregnancy,” an event that is not well understood but may be evolutionarily linked to ancient wolf pack dynamics. So when a dog has her muzzle stuck right up against your skin, and especially near the apocrine glands in your crotch region, it just makes sense she will be able to scent out valuable information about your estrus cycle as well, whether she is familiar with you or has met you before or not. Can Dogs Sense Pregnancy Before You Know? For something as important as getting pregnant, you would think you would know about it before anyone else. After all, it is your own body and life that is most affected by this shift. But interestingly, your dog may be more tuned in to you than you are to yourself. Dogs have literally evolved, and in some ways have been created, to be incredibly attuned to people. From the perspective of how dogs know when you are pregnant, imagine how your behavior or even your daily routine might subtly begin to change as soon as conception occurs. For instance, you might begin getting up in the middle of the night to urinate more frequently. You might feel or act more irritable. You may experience morning sickness. You might sleep in a little later or take more naps during the day. Your food choices may change (and if there is one thing dogs reliably tend to notice, it is food). Your facial expressions may even be different. Of course, noticing these types of small behavioral or routine changes would not be any help to a dog that doesn’t know you well and isn’t already bonded to you. But your own pup would naturally notice these slight shifts—and perhaps would do so well before you notice them yourself. Can Dogs Sense Pregnancy by Hearing? One intriguing question that canine biologists can’t definitively answer as of yet is whether dogs may be able to sense pregnancy by hearing the infant’s heartbeat. For general purposes, the heartbeat in an unborn baby typically begins around week six (gestational) or week four (fetal age). Research tells us that dogs can hear frequencies both above and below what the human ear can detect. They can also hear sounds located up to four times further away than what the human ear can hear. Most amazingly, dogs can move each of their ears independently to gather more sound waves and hear in more detail than humans can hear. So while your doctor might need to use a stethoscope or perform an ultrasound to detect and hear your unborn baby’s heartbeat, the average dog may be able to hear that same heartbeat just by standing in your general vicinity. In reading through this article, it is easy to see there is more research that needs to be done to fully understand if and how can dogs sense pregnancy in people. In the world of research and science, “evidence-based” information that has been collected through rigorous scientific process is highly prized. Conversely, “anecdotal evidence,” or evidence that is generated via anecdotes (stories), generally ranks low on the totem pole. But some researchers are starting to think differently, especially researchers involved in the newer field of social science. Here, qualitative (long form stories) as well as quantitative (hard numeric data) can come together in useful ways to shed new light on complex social issues, dynamics and relationships. This may mean anecdotes from pregnant women (like the actress Tia Mowry mentioned earlier) who say a dog alerted them to their own pregnancy may someday be as highly valued as mathematical statistics to explain exactly how dogs seem to do what they do. According to the U.K. organization Medical Detection Dogs, dogs can help humans with serious medical issues by issuing early warnings to take action. One of the aspects that is so wonderful about this organization is how they collect owner/dog stories (anecdotal evidence) attesting to specific times when their trained medical detection dogs—on their own—initiated life-saving interventions. But how exactly do dogs let you know what they know about your pregnancy? Perhaps the most common way is, once again, with their noses. A wet nose pressed repeatedly and insistently up against a particular area of the body is one way a dog may try to get your attention to convey important information. With training, a matched owner/detection dog team can work out a system where the dog can alert the owner about dangerous shifts in body chemistry or pheromones (hormones). In some cases, the dog can even be trained to bring an owner necessary medication or medical aids to head off severe health symptoms. Perhaps one day there will be “pregnancy dogs” that can sniff out your pregnancy and save you the trouble of taking those pesky pregnancy tests. But for now, at least to hear pregnant gals tell it, it will still fall on you to be alert to how the pups in your life react to and interact with you to pick up on subtle cues that you may be pregnant. Signs to watch for can include the “wet nose press,” more of a desire to cuddle with you, attention from a dog you do not know directed toward your abdominal area, or even your own pup persistently laying his head on or near your belly region. Can dogs sense pregnancy—What do you think? Have you had an experience where a dog—yours or someone else’s—has sensed your pregnancy? Or do you know someone who has had this type of experience? What do you think? Can dogs sense pregnancy in “their” people or in strangers? We’d love to hear your thoughts and your story. Previous articleSkin Tags On Dogs: What Are They and Should You Get Them Removed?